HAL Bangalore Complex is currently looking candidates for appointment as Chief Manager (Grade-VI)/ Chief Medical Superintendent (Grade-VI) / Senior Managers (Grade-V) / Managers (Grade-IV) / Medical Superintendent (Grade-IV) / Deputy Managers (Grade-III) / Senior Medical Officers (Gr-III) / Engineers (Grade-II) / Officers (Grade-II) / Assistant Engineers / Assistant Officers (Grade-I). i) The Himachal Pradesh Public Service Commission (Authorised Agency) announces holding of State Eligibility Test (SET) on 21/08/2011 (Sunday) for determining the Eligibility for Lectureship in universities and colleges located within the State of Himachal Pradesh. The test will be conducted in 20 subjects listed below at various examination centres located at Shimla, Solan, Mandi and Dharamshala. Vignyan Industries Ltd, manufacturers of high quality castings products is looking for high performing, dynamic & achievement oriented professional for its state-of-the-art Steel Cast Foundry situated at Tarikere, Chickamagalur District, Karnataka for the following positions. BA, B.Sc, B.Com & BBA etc. G.G. Agharkar Road, Pune - 411004, E-mail:arilib@pn2.vsnl.net.in. Applications are invited for a temporary position of Laboratory Assistant on purely contract basis under the DBT sponsored Project `Accredited Test Laboratory (ATL) under the National Certification System for Tissue Culture raised Plants (NCS-TCP)’ being operated in the Genetics Group, (Project Period up to 11.02.2012). Essential Qualifications: 1st Class B.Sc. in Botany/ Biotechnology/ Agriculture. Last date for receipt of application is 08.07.2011. Applications are invited for a temporary position of Junior Research Fellow (one) under the DBT Project on `Recovery of Ret Species of Ceropegia from Western Ghats’ (SP/185, period up to 09.01.2015), being filled in through Walk-in-interview to be held on Tuesday the 12th July 2011 at 10.00 a.m.. Qualifications: Essential : (i) 1st class M.Sc. in Botany with specialization in Taxonomy/ Physiology/ Biotech and (ii) clearance of CSIR-UGC/NET test of JRF. Desirable: Experience of handling tissue culture techniques and field studies for collection of desired species. Monthly Stipend : Rs.12,000/- + HRA (fixed). Age Limit : 28 years relaxable by 3 years for OBC and 5 years for SC/ST and Female candidates. In case of non-availability of qualified JRF, candidates having M.Sc. (subject as above) with at least 55% marks may be considered for Research Studentship with monthly stipend Rs.11000/- (fixed). Last Date: 05.07.2011 up to 5.00 p.m.
Andhra Pradesh Paper Mills Limited - One of the biggest, integrated pulp and paper manufacturing companies in India. Working more than 5 years in Power Plant of High Pressure Boilers with operating pressure 64 Kgs/cm2 to 100 Kgs/cm2 Plants. He has to organize and operate total activities of DM Plant (DM Water Generation). Boiler water treatment with different treatment programs, Turbine cooling water treatment and Dearator operation with practical and theoretical knowledge. Working more than 3 - 5 years in Power Plant of High Pressure boilers with operating pressure 64 kgs/cm2 to 100 kgs/cm2 plants. He has operate total DM Plant (DM water generation). Boiler water treatment, Turbine Cooling Water Treatment. Working experience of 5-6 years. He has to have the knowledge of Recovery Boilers, ESPs, Causticizing equipment, DM Filter, Rotary Lime Klin etc. Applications are invited in prescribed format for the following temporary posts for a period of three years. The selected candidates may be considered for appointment on a permanent basis subject to an assessment. Qualifications & Experience: M.Sc. in Chemistry OR B.Sc. in Chemistry with 2 years relevant experience. Knowledge of computer applications desired. Qualifications & Experience: B.E. (Mechanical). Some experience in design, estimation, tendering and billing of new air conditioning work including central/ package/split/window air-conditioning, maintenance of same air conditioners; computer applications for the air conditioning job; electrical power supply and control of air conditioners; energy efficiency of air-conditioning. Qualifications & Experience: Degree from a recognised University or equivalent. (ii) Bachelor’s degree/equivalent Diploma in Library Science of a recognised University/Institute obtained after graduation. (iii) Experience of two years in a Library/Computerisation of a Library or one year certificate in Computer application from a recognised Institution or equivalent. Candidate appointed to the post will be required to work on shift duties and on holidays, whenever necessary. iii) At least three years’ professional experience as Cinematographer and/or teaching experience in Motion Picture Photography or cinematography in an organization or institution of repute. Degree of a recognized University of equivalent. Production Organization or TV Studio or Production Unit of repute. ii) A relevant License issued by the Competent Authority to work in 3 phase 440 volt electric line. iii) At least FOUR years’ experience in related field in a Film Studio or equivalent Organisation of repute. Qualification / Experience : Candidate should be M.A in Hindi or English from a recognized University with atleast 2nd division and both Hindi & English as main/ subsidiary subjects at graduation level with 5 years experience at executive level in the implementation of official language policy and in finalization of translation from English to Hindi & vice -versa. Essential : Working knowledge/ conversant in Computer Applications such as MS office. Qualification: Minimum 2nd class Graduate with 1st class MBA (Material Management) full time. Minimum 2nd class Graduate with 1st class two years PG Diploma in Material Management. Minimum 2nd class Graduate with 1st class two years PG Diploma in Quality Management. 1st class Integrated MBA (Material Management) full time. The above Degrees should be obtained from Govt. recognized Universities or Institutes. Application such as MS office etc. PB-3 Rs. 15600-39100 + Grade Pay Rs. 6600/- + Usual allowances. PB-3 Rs. 15600-39100 + Grade Pay Rs. 5400/- + Usual allowances. 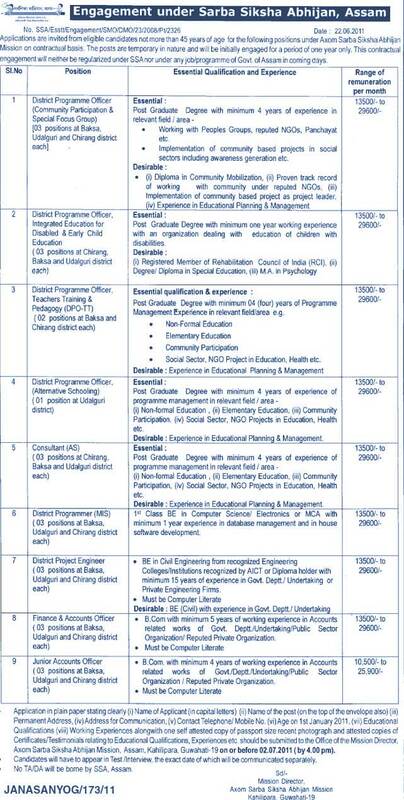 Last date for online application is 18.07.2011 upto 5.00 PM. Applications in prescribed form are invited from Indian nationals for filling up the following Teaching & Non-teaching positions at Silchar & Diphu Campus with UGC pay scale in the University. Last date for issue of application form 14/07/2011. Inviting applications for positions of Sister Tutor in Bihar. 2. The recruitment will be on contract basis for a period of 1 year or till regular appointment is made, whichever is earlier. The Gujarat Water Supply & Sewerage Board is a Government of Gujarat owned Statutory Board engaged in providing Water supply and Sewerage facilities in the state of Gujarat. The Board requires the following Senior and Middle Level Technical Personnel. Qualification: A degree in Civil Engineering of a recognized university OR its equivalent qualifications. Operating skills in MS Office, MS Project and AutoCAD. Experience: Have Three years of experience in Civil Engineering construction works. Qualification: A degree in Mechanical Engineering of a recognized university OR its equivalent qualifications. Operating skills in MS Office, MS Project and AutoCAD. Experience: Preference will be given to the candidates having relevant experience.